SanDisk has released a new Windows 7 solid state drive caching solution that doesn’t require the user to replace their existing hard drive, clone their operating system or migrate any data. Simply connect the 32GB ReadyCache drive to a spare SATA III port alongside your primary hard drive and run the ExpressCache software – it’s as easy as that. As with other SSD hybrid / caching solutions, the idea here is that you can get SSD-like speeds while still maintaining the large capacity afforded by a traditional spinning hard drive. SanDisk claims their solution can launch applications up to 12 times faster than a standard hard drive could and your system will boot up four times faster than before. The drive is rated at 480MB/s read and 115MB/s write – lacking on the write speed compared to most mainstream SSDs that would replace a hard drive but for a caching solution, it’s fine because you’re more interested in read speed. Included with the drive is a 12-inch SATA 6GB/s cable, a 3.5-inch bracket and mounting screws. SanDisk backs the drive with a three year limited warranty should you run into any issues. It’s also worth pointing out that should the drive fail or if the caching solution is uninstalled, all data found in the cache also resides on the primary storage solution meaning you shouldn’t lose any information. 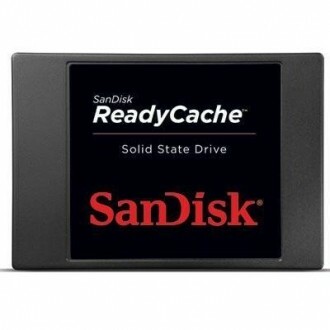 SanDisk’s ReadyCache drive is available right now through Amazon. The list price is $99.99 although as of writing, the SSD can be had for under $50.